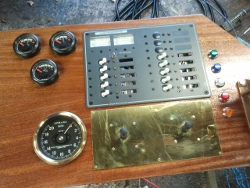 We can design and provide instrument panels to your specification. Panels can be from hardwood, polished aluminium, stainless steel, nylon, ….. They can be cut and shaped to what every you require. We can replace old mechanical rev counters with modern electronic ones. These can be driven from the alternator or from a rotating shaft. We can also provide wiring looms to any length. These can be “plug and play” if required. Featuring suitable fuses they will be colour coded to marine standards.